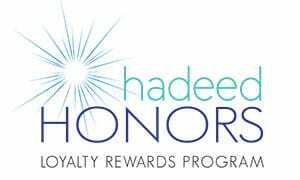 What is the Hadeed Honors Loyalty Rewards Program? The Hadeed Honors Loyalty Rewards Program is our way of rewarding Josef Hadeed Plastic Surgery patients with exclusive savings and greater value on their future aesthetic services. It is our special way of showing appreciation for our most loyal customers. Patients earn (1) Hadeed Honors point for every dollar spent on injectable treatments and retail products. Opportunities to earn bonus points will occur at various times throughout the year in our advertised promotions and special events–giving patients the chance to accellerate their point accumulation. How can I earn Hadeed Honor points? How do point values add up? What can I do with the dollars in my Hadeed Honors account? The dollar value of your Hadeed Honors points can ONLY be redeemed for future services, treatments and retail products at Josef Hadeed Plastic Surgery. They are not redeemable for cash. Hadeed Honor points do not expire and are non-transferrable. Points are not redeemable for cash, and may not be used towards any outstanding balances. If any product is returned, any accrued points will be deducted. Points cannot be earned on procedures covered by insurance. Josef Hadeed Plastic Surgery may, at its discretion, terminate, add to, or change the conditions of the Hadeed Honors Program.